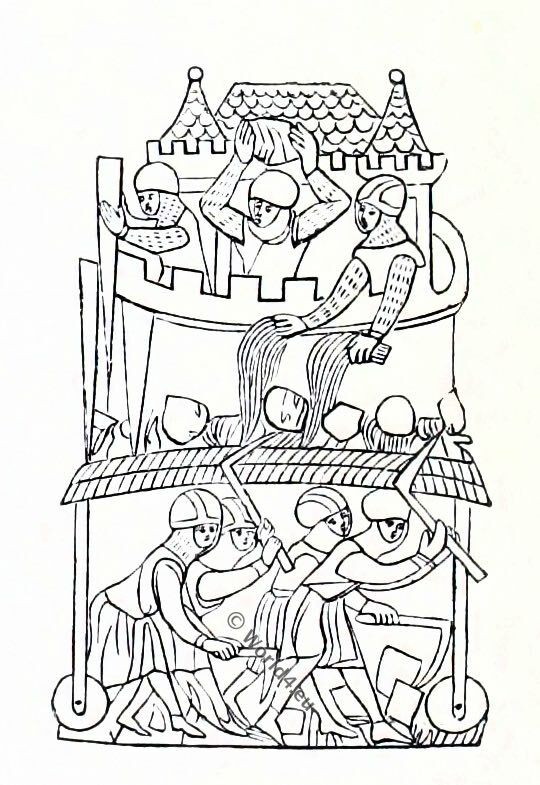 Medieval knights in combat. MS. Reg. 20 D, I.
Q- dropcap. Royal Library, Paris 13th century. QUIETNESS and peace were not among the most prominent characteristics of those ages, in which, unfettered by the sage power of judicious and efficient laws, people were taught to seek justice rather by their own strength, than by the intermediation of others. At that period, the songs which sounded most musical to the ears of the iron-cased barons were the romances that told of hard blows and doughty adventures, and the pictures most beautiful to their eyes were such as those which we here give in ouer plate. The Volume from which they are taken, a fine manuscript of the middle or latter half of the thirteenth century (MS. Reg. 20 D, I.) is well fitted for knightly eyes as well as knightly ears; for it contains a large mass of the romantic history, adorned with a profusion of warlike pictures. 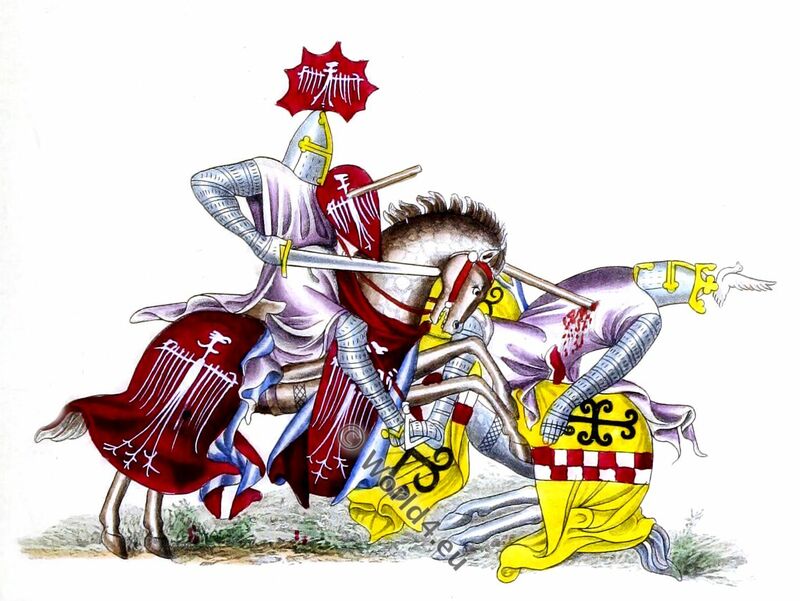 In the margin, no less than in the text, the heroes of Thebes and Troy, and other worthies of ancient story, are represented combating with all the arms and attributes of medieval knights. Our wood-cuts represent some of the instruments used, during the middle ages, in carrying on sieges. 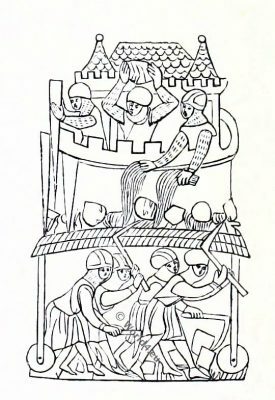 In the one at the head of the next page, taken from the manuscript just described, whilst a party are preparing to attempt the breach which has been made in the tower, others are raised by means of a wooden machine to fight on an equality with the soldiers on the walls. On the other side of the picture, similar expedients are adopted to raise the men in the ships. The other two cuts are taken from MS. Reg. 16 G, VI. a chronicle of France written at the end of the fourteenth century. 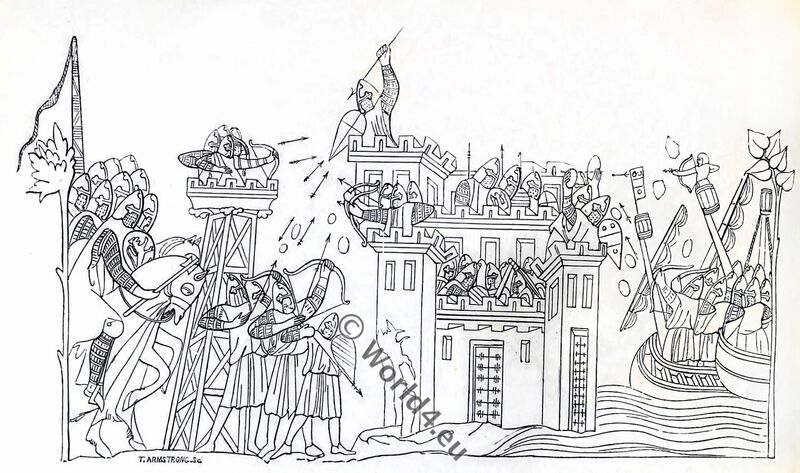 One of them represents a machine used for throwing great stones at the walls, or into the castle; while in the other we see the assailants, under cover of a kind of shed which has been moved by wheels up to the walls, and which the besieged are attempting to destroy with stones and Greek fire, undermining the tower. 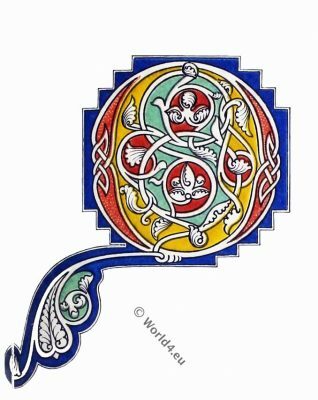 This instrument was called, perhaps under different forms, by the different names of, a sow, a vine, or a cat. The latter name was also given sometimes to a machine for throwing stones. He prepared his calabres, and the ill neighbour, And his other machines for throwing stones, and the lady, and the queen; He breaks the lofty walls and the hall of stone. 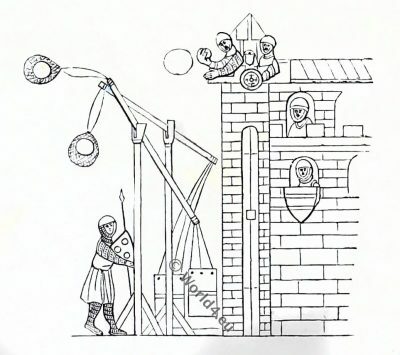 The machine called calabra, or carabaga, was also used for throwing large stones. 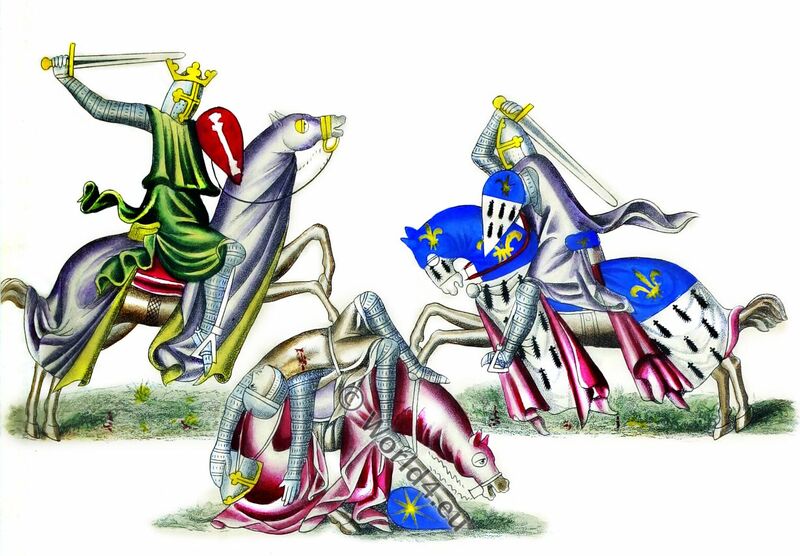 According to William de Rishanger, it was the second Simon de Montfort, son of the preceding, and so famous in our barons’ wars of the thirteenth century, who introduced most of these machines into England. At the siege of Rochester, garrisoned by the partisans of the king (Hen. III. 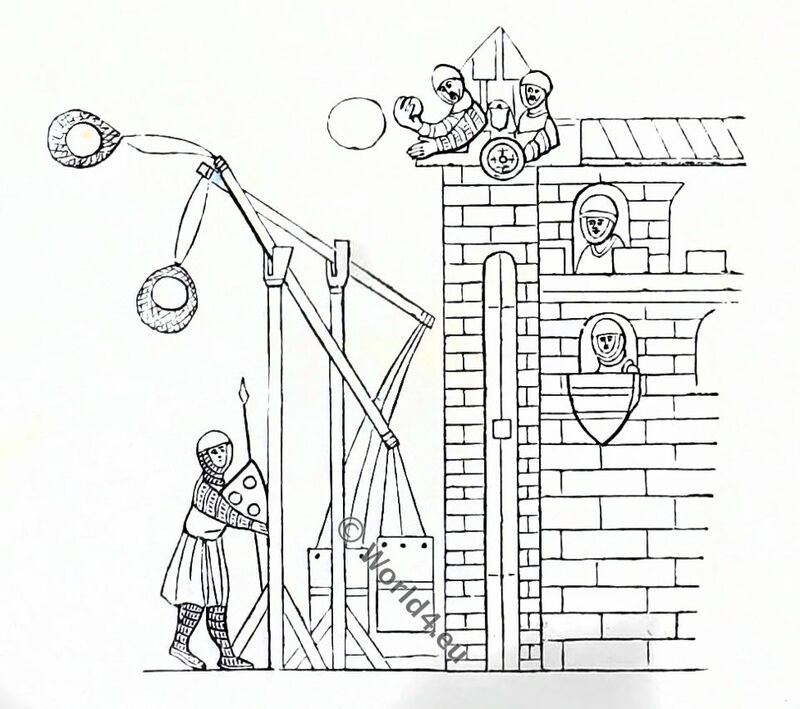 ), he used against the castle a machine which threw stones of the weight of upwards of a hundred pounds. The initial letter at the beginning of the present article is taken from a MS. in the Royal Library at Paris, of the thirteenth century. This entry was posted in 12th Century, 13th Century, England, Middle Ages, Military, Plantagenet and tagged Henry Shaw, Knighthood, Medieval costume on 1/13/17 by world4.